Lathes aren’t half as popular as they should be, given how useful and easy to operate they are. You can learn to use them within a couple of days, even though mastering one can take a lifetime. The amount of possibilities for using a lathe are literally endless, with the types of woodworks that you can craft being limited by nothing more than your imagination. A lathe works by holding your chisel in a spot on the lathe as your piece of wood rotates in order to carve it. This process slowly gives shape to the wooden object which you desire, be it a pen, vase, plate or anything else. Wooden bowls are among some of the most popular things to create using lathes, and are easy to make too. Now, obviously the type of tool that you need will be determined by your requirements, the most important of which is the size. If you’re going to be making bowls, you have to decide on the size of biggest bowl you might want to make, especially its diameter. You will need a lathe with a “swing” that is at least of that diameter. Swing is the distance between the rotation axis and the base of the lathe. A bigger bowl simply won’t fit into the lathe. So this will put a lower limit on the size of the lathe you are looking for. The distance between the tailstock and headstock, on the other hand, matters less, since a “bowl” will typically be more wide than tall. The only problem is that it’s usually hard to identify a good lathe on the market. A lathe that is made of poor quality materials, or doesn’t have the right motor can spell trouble, and will do nothing in the long run but result in frustration and a waste of your time. In order to help you steer clear of such lathe sets, we’ve chosen some of the best ones that we could find. These lathes are great if you’re planning to do some bowl turning. This machine by Shop Fox is one of the best options available when it comes to lathes that are great for bowl turning. It isn’t too expensive when it comes to lathe sets. In fact, it belongs to the lower price range of the market spectrum. For this price, it offers every feature which you could possibly need in order to successfully craft your own custom bowls on it. Instead of having preset motor speeds, you can adjust it manually to the speed you want in between 700 and 3200 RPM, giving you the flexibility and ease which you need to comfortably turn anything. It has two tool rests, one of 4 ½ inches, and another of 7 inches, which are excellent because they make the turning process much quicker and simpler. 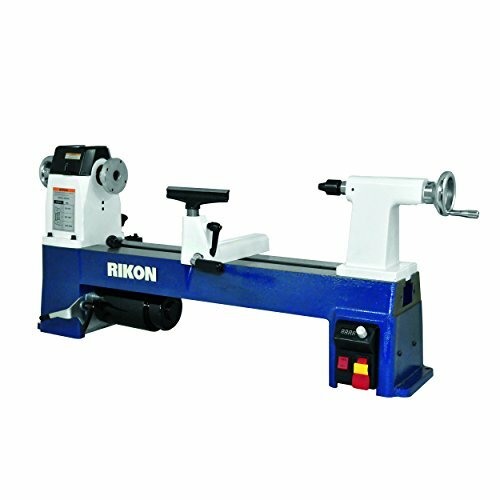 Due to its simplicity and low end price, it is well-suited for anyone who is beginning with woodworking and looking for a new lathe to work with that isn’t too high end and complicated. It can be bolted down on the surface through the 3 holes in its base which makes it all the more stable and convenient to use. All in all, this lathe set is great to work with, and generally very few issues if any. When it comes to price, the VSR MIDI by Rikon is the complete opposite of the one above by Shop Fox. This product is perhaps one of the most high end lathes that you can possibly find, and has features which compensate for its hefty cost. The first thing to notice on this lathe is its motor, which comes with variable speeds that you can set up manually to match your comfort level depending on which part of the turning process you’re at. Its speed range is between 250 to 3850 RPM, which is significantly larger than the Shop Fox lathe set, and can rotate both ways. It even has an LED display. It has a pretty large turning capacity as well. This lathe is best suited for people who are pretty serious about turning bowls. 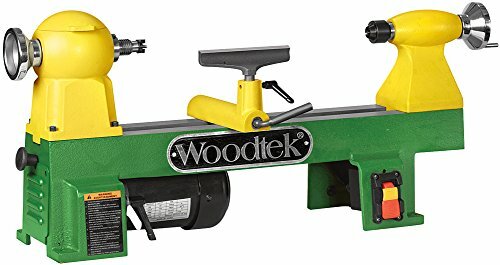 Last one this list is the Midi lathe by Woodtek. This lathe is right in between the other two lathes mentioned when it comes to price. 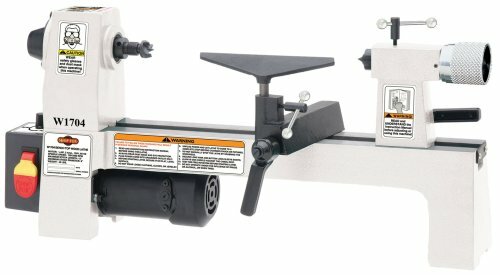 Designed for handling all sorts of small turning projects, this lathe is perfect for turning bowls. Despite its cast iron body, it is surprisingly light and compact. This item is perhaps the best out of the 3 due to its balanced price compared to its outstanding performance. Whether you’re a casual or a serious woodcrafter, this lathe is one product that won’t let you down if you decide on buying it. Woodworkify.com is a participant in the Amazon Services LLC Associates Program, an affiliate advertising program designed to provide a means for sites to earn advertising fees by advertising and linking to amazon.com, amazon.co.uk, amazon.ca, and any other website that may be affiliated with Amazon Service LLC Associates Program.